Exercise while Working: Can We Make Standing Even Better? Katy Bowman, author of "Move your DNA: Restore your Health Through Natural Movement," states that we should "exercise less, and move more." She says that "the problem is that most people fail to consider that their workouts are bookended by hours upon hours of sedentary behavior." But can you really exercise while working? According to Katy, repetitive positioning is a related problem, such as sitting (or standing) in the same habitual positions is a key problem. "You don’t have to be still in the same way." So, sitting differently, when you sit, and standing differently, when you stand, is key to "moving more of you." 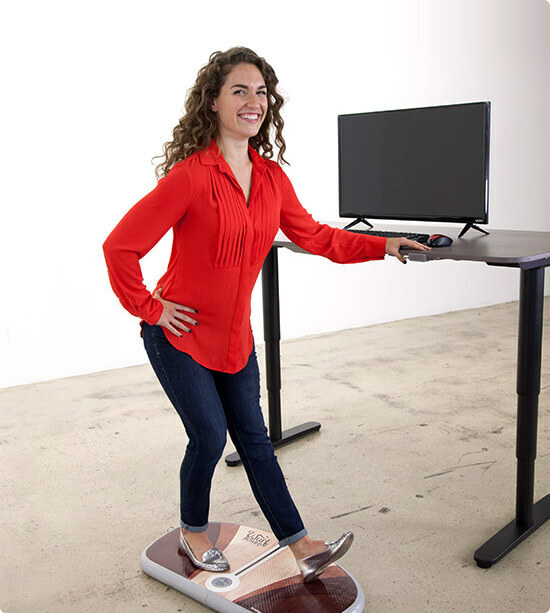 The key to minimizing the negatives of prolonged sitting at work while maximizing the benefits of standing during work centers on engaging in regular "movement" while standing in place rather than exercise while working. How can one move more while standing still? The crucial issue is how one moves when standing in place. The body’s lymph system is a toxin removal system that needs movement to work. In addition, blood flow to the muscles can be inhibited by static standing or sitting. But, even very small or micro movements can provide sufficient biological "movement" to allow these key body functions to operate. Flexing muscles during even small, tiny movements provide the pumping action for the blood to flow and the lymph system to work. The result is less fatigue and less posture related pains and more energy; even during the dreaded post lunch slump. The Wurf Board is unique as a standing anti-fatigue mat because it encourages constant micro movements by the standing user; virtually exercising while working. So, while a person is standing "still" in one place while working at a standing desk, they are not biologically still in terms of blood flow and lymph function. The results are startling. Where one may stand comfortably for one hour on a typical compressive anti-fatigue mat, that same individual can stand for many hours on a Wurf board. The reason is that a user continues to make micro movements on the Wurf Board while also standing relatively still and focused on their work. These often unconscious movements’ keeps blood flow and lymph function going without the distraction of active exercise. This result falls right in line with Katy Bowman’s theory of constant movement offsetting the problem of repetitive positioning. With the Wurf Board, one is never "still in the same way" as Katy would say. Jeb is a Certified Strength and Conditioning Specialist and Certified Athletic Trainer, well versed in the benefits of exercise while working. But, when he stands in one place to work, whether at a standing desk with his computer or elsewhere, he takes his Wurf Board with him. "The Wurf Board allows me to be stationed in one place without being static," states Jeb, "and that has made all the difference while standing at my computer."